For more delivered by Leisa Ebere tap/click here. The first prophetic word brought to my attention is God’s Mandate for the Prophetic Profiling of our Nation, followed by the UK Nationwide Circuit Prophecies; the first of which for 2018 promises the Lord will give His prophets “the ability to see clearly My numbers” – Fulfilled Prophecy #38 refers! The Kingdom is woven into all the teachings of Christ. He taught us to pray, “Thy Kingdom come”. He taught that our good deeds on earth are seen by our Father in Heaven, and that He will reward us in the resurrection. He taught that His Kingdom is not of this world, and that this world is in darkness. Christ’s moral teaching is so sublime as to be unattainable by the flesh: it is the power of the Spirit, who is given to us as an earnest of the Kingdom, that makes us able to live as Christ did. In updating me on his thoughts about Britain and the EU, Neil Mackereth (author of SIGNS) enables our further consideration of the prophetic word on the Lord being in control of Brexit. A spiritual indifference has taken root in the world today. The rulers, leaders, decision makers and diplomats are trying to direct nations and solve problems using the wisdom of this age – their own “wisdom”, world-view, self-interest, conceit and disdain (see 1 Corinthians 2:6, 14.). As always, God is in control and is working out His purposes. We need to keep our spiritual eyes and ears open in these turbulent times and seek to understand the Kingdom perspective and significance of events. We may be mystified but we can still choose to go with God in the fulfilment of His purposes. His ways are not our ways; however, He wants us to be involved and what matters most is maintaining our relationship with Jesus and doing our utmost to fulfil the great commission. Is there a link between following biblical guidelines and the wellbeing of the nation? The secular world ridicule suggestions that God is in control. They are mistaken. The Balfour Declaration of 9 November 1917, promising a national homeland for the Jewish people in Palestine, shows the efficacy of the principle expressed in Genesis 12.3 “I will bless those who bless you”. The declaration, first aired on 2 November, became agreed Government policy a week later. It was heartfelt and undoubtedly blessed the Jews: there was an almost immediate counter blessing! General Allenby, the British commander in the Middle East, launched an offensive to capture Jerusalem on 31 October 1917. He took Gaza on 7 November and Jaffa on 16 November. As Allenby’s forces approached Jerusalem the German and Turkish forces decided to withdraw from the city. General Allenby and his commanders walked into the undefended city of Jerusalem on 9 December 2017. That was truly remarkable! Unfortunately, subsequent governments have not shown unity or clarity in their endeavours to bless God’s chosen people! The value of the pound will fall – it has but that has not been the predicted disaster. It has proved beneficial to trade and made the UK an attractive proposition/haven for overseas investors, the pound is recovering. Cracks are appearing in the unity of the EU nations: their instability is ignored by the UK prophets of doom who continue their barrage, many demanding a second referendum. The amazing thing is, the pundits are still held in high esteem! We have a God of the unexpected and the above list indicates that God’s hand is on Great Britain. The significance and progressive nature of each step only becomes clear with hindsight. Similarly, I am sure that the reasons for the current political confusion and government disarray will be apparent “after the event”. I am reminded of Habakkuk; we watch to see God’s plans unfold, confident in the knowledge that however turbulent the immediate future may be, His plans will not be thwarted. Furthermore, God told Habakkuk to tell the nation what was to happen. I don’t know whether a deal (i.e. with fair contractual agreements) or a no-deal Brexit is best, but He does: instead of being in the worst position, as so many argue, knowing Him puts us in the best position. We are at a pivotal moment. The signs of demonic influence in the EU are startlingly obvious, to those who have eyes to see and ears to hear. Brexit threatens to hasten the break-up of the EU (I think it was inevitable). Whatever people may say; Brexit is a calamity for the EU. God is rescuing the UK from an unholy alliance, to be a tower of strength, a light in a dark place, a refuge and a sanctuary. Our God is not a God of compromise. Pray, pray and pray again for a clean, fair and complete break from the EU. Pray for the adoption of the underlying principle that UK policies will be biblically based and will seek to bless the Jewish people (this does not mean endorsing or condoning any unreasonable actions/words of secular authorities or leaders. It does mean help in safeguarding the rights and security of Israel, and of the Jewish people worldwide). Watch and be amazed: we constantly underestimate the greatness of our God and we constantly underestimate the power and authority of His Word. He is birthing something new for the nations of the world, which apparent from the shaking and repositioning we are witnessing. It heralds the time of tribulation, which will culminate in the return of Jesus. Footnote: Neil has this undated paper which I’ve termed an ‘Addendum’ to the above. ‘Welcome to my musings about what’s going on in the world and I trust this blog may help you gain some insights. Indeed, what on earth is going to happen next? ‘You may find some of my ideas challenging, even outlandish! For instance, come on an imaginary trip in a ‘time machine’ and, later, receive unusual instructions on how to tell the time! Jerusalem Post lead story, first in-depth article on what MBS told Joel Rosenberg behind closed doors in Riyadh Palace. An important development in the light of the prophetical lightning strike upon Mecca’s Grand Mosque on the 14th anniversary of 9/11 and subsequent events two years later, as noted here. (Jerusalem, Israel) — On Wednesday, The Jerusalem Post published the first in-depth story on our Evangelical Delegation to Saudi Arabia, why we went, and what the Crown Prince told us behind closed doors. As I told editors Yaakov Katz and Seth Frantzman in the Post’s offices yesterday, the entire meeting in the Royal Palace was on the record, except for what MBS told us regarding his views of the Arab-Israeli conflict. Our team took detailed notes and I provided some of the excerpts of our conversation to the Post. Here’s the article. MBS TO EVANGELICALS: KHASHOGGI MURDER WAS TERRIBLE “HEINOUS ACT”: But he won’t let it stop his ability to take his country where he wants to go, the delegation head says. He itemises many things demonstrating President Trump is the best friend Israel has ever had in the White House, as well as giving a timeline of his administration’s peace efforts and public comments in the last two weeks whilst Florence developed. Bill also notes Trump will now have been president during four of the costliest hurricanes in US history, including Hurricanes Harvey, Irma and Maria during the month of Elul in 2017. Wed 5th – Emir of Kuwait visits White House as Florence was continuing to develop. Last year on September 7, President Trump had a joint press conference with the emir as Hurricane Irma was developing into a record-setting Atlantic Hurricane…Florence becomes major hurricane as Category 3 storm. At of 125 mph is five mph away from Cat 4. Sat 8th – Special Envoy Jason Greenblatt presents details of the Thinking Behind the Mideast Peace Plan – JNS (Tasked by Trump to help reach the “deal of the century,” Greenblatt serves as one of Trump’s top Middle East envoys and has herculean task to help negotiate peace plan between Israelis and Palestinians. Sun 9th – late afternoon Florence became a massive Hurricane 4 storm. Wed 12th – Envoy Greenblatt’s Twitter comments on Trump peace plan. He notes that ‘Isaac’ has become a hurricane and heading toward the Lesser Antilles. Last time a storm named Isaac formed was the day the Republican Platform Committee endorsed two state plans in August 2012 and caused the 2012 Republican Convention to cancel their first day. Following the previous post on a few national leaders who bless or curse Israel and, noting Turkey’s Erdogan fits the bill, I draw your attention to Caroline Glick’s latest, perspicacious as ever, in-depth analysis and encourage you to read it in its entirety. Brunson has lived in Turkey for 23 years but in October 2016 routinely went to the local police station to renew his Turkish visa – but got detained instead! Caroline’s methodical manner of recapitulating an issue’s history is very helpful to those new to the topic, as well as adding weight to her observations and sound conclusions. William Koenig describes her journalism as ‘ne-plus ultra’ (none better). Caroline Glick born in Houston, TX and grew up in Chicago, IL, moved to Israel in 1991 after receiving her BA in Political Science from Columbia University, joined the Israel Defense Forces that Summer, serving as an officer for over five years. 1994-96 as an IDF captain, Ms Glick served in the Defense Ministry as a core member of Israel’s negotiating team with the Palestinians. 1997-98 served as Assistant Foreign Policy Advisor to Prime Minister Netanyahu. 1998-2000 studied at Harvard University’s Kennedy School of Government and received a Master’s in Public Policy in June 2000. Summer 2000, Ms Glick returned to Israel and began writing at Makor Rishon newspaper (Hebrew), served as its chief diplomatic commentator ’til Jan 2008. March 2002, joined The Jerusalem Post as Deputy Managing Editor and senior columnist. Today, as Senior Contributing Editor, Ms. Glick is the newspaper’s most widely-read columnist. She began writing a weekly Hebrew language column for Maariv in 2014 and began writing at Breitbart in January 2018. 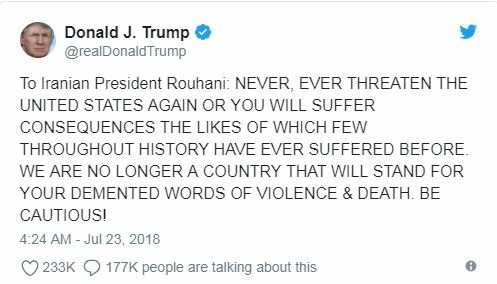 So, around the 6th anniversary of the previous Iranian president’s End-times threat to Israel announced in the United Nations – plus years of belligerent threats, including that of “the mother of all wars” (ie. ‘Armageddon’), as oft’ reported here – at long last there’s now someone with a very big stick promising to make them eat their words!